And they even let me use my own photo on the cover! The book is based on GNS3 v0.8.7, which was the last release of GNS3 before the move away from a 90% Cisco centric model with the crowd-funded development of GNS3v1.x. 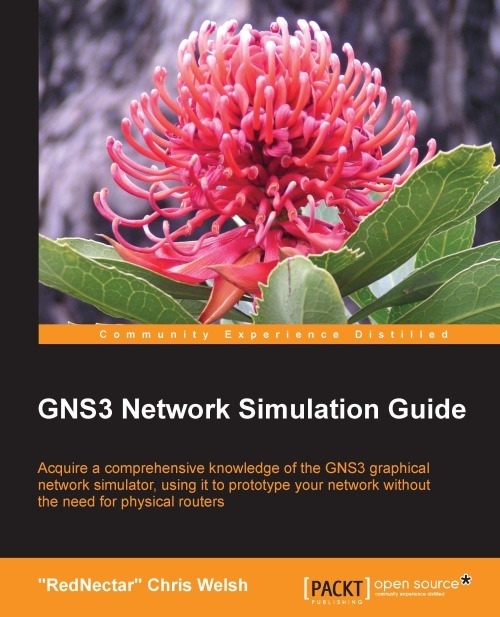 To get your copy of GNS3 v0.8.7, either do a Google search, or go directly to SourceForge using this link or of course you can use my GNS3 WorkBench – look for v8.7 releases to get the best match for the book! This entry was posted in blog, CCNA, Certifications, Cisco, dynamips, GNS3, GNS3 WorkBench, ICND1, ICND2, idle-max, Idle-PC, idle-sleep, idlemax, idlepc, idlesleep, Labs, vpcs, wordpress and tagged CCNP, Cisco certification, Cisco routers, GNS3 Network Simulation, graphical network simulator. Bookmark the permalink. Nice book Chris. And thanks for all the help with the 7600. Just purchased the book, great read. And now eagerly waiting for the workbench update. WB is coming – reworking instructions – fighting with html – very tedious – and adding more exercises. looks very promising and very professional ! I’ve already already bought the book and I’m learning a lot from him. Can’t wait 4 new WB. Congratulations Chris on the release. Good work. I enjoyed the book and I hope your readers gain some valuable tips from it. Thanks Tony – saw your tweet too!